In the days leading up to the Christmas Day limited release of the civil rights era film Selma, the filmmakers and lead actors saw fit to integrate messages from the Black Lives Matter protests and social media campaign into their promotion of the new movie last month. That merger of film promotion and social protest proved particularly memorable Dec. 14, the day of the New York premiere when Selma cast members and director Ava DuVernay posed for photos while wearing “I Can’t Breathe” T-shirts during a protest marking Eric Garner’s chokehold death by a New York City police officer. The photos taken that day left no doubt about the conviction the actors and filmmaker have that the racial oppression portrayed in Selma will resonate strongly with American audiences. “You watch those images [in the Selma film] and you understand how it feels to be someone in  being shocked about what they saw on TV because it just happened to you in August ,” said DuVernay in a Time.com video describing how some Americans have reacted to television news coverage of the Ferguson, Missouri, protests that following the fatal police shooting of Michael Brown. As distribution of Selma expands nationally to many hundreds of movie theaters today, some scholars and critics contend the new film could very well provide the experience of connecting Americans to civil rights movement history with their present-day understanding of police brutality and suppression of voter participation through burdensome voter ID laws. Such connections, some say, may help sharpen the sense of purpose and strategy that young Americans are developing as they participate in social protests sparked by the Black Lives Matter movement. Since last month, Selma has garnered rave reviews from critics and attained Golden Globe-award nominations for its portrayal of the Selma, Alabama-based nonviolent voting rights campaign that led to President Lyndon Johnson’s successful lobby of the 1965 Voting Rights Act legislation. 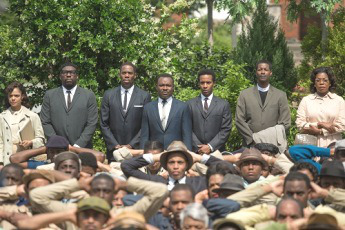 It’s widely believed that Selma will receive Academy Award nominations, including ones for Best Picture and Best Director. In contrast, the Black Lives Matter movement “reads as just an exercise in catharsis, a declaration of dignity and a plea for humanity,” according to Bouie. “This isn’t a bad thing, but it isn’t a strategy. Not only could “Black Lives Matter” shift attitudes on criminal justice and force a needed conversation about police culture and police violence, it could create political space for changes to law and policy,” he writes. “There’s no doubt that this is a vital moment. With protests across the country and endorsements from major figures in American society, “Black Lives Matter” might be the most significant youth movement in recent history,” Bouie declares. Dr. Erin D. Chapman, an associate history professor at George Washington University, said her “general impression [of Selma] was favorable” and that it represents a step forward for civil rights history films, which in the past have displayed “an urgency around redeeming White manhood.” This new film “pushes beyond that frame and endeavors to centralize the people we know who were central to the events that happened,” she noted. Chapman, however, found Selma problematic, despite DuVernay’s statement that Selma is not to be considered a biopic, because the movie “still takes Martin Luther King as a Moses figure, a messiah figure who was leading the movement essentially by himself,” she told Diverse. “[King] was certainly the spokesperson, the person out front, but the movement could not have happened in Selma … without the grassroots [organizing]” that had taken place prior to the arrival of King and his Southern Christian Leadership Conference colleagues, Chapman said. In addition, Chapman contends the narrative around the success of Voting Rights Act is troubling with the film failing to acknowledge the current day court rulings that are eliminating voting rights protections and the enactment of voter ID laws in a number of states. The omission of these developments in the film’s final minutes as text about the lives of prominent individuals in the film flashes on the screen proved disappointing to Chapman. “There was no statement regarding the recent gutting of the Voting Rights Act by the [U.S.] Supreme Court. … And I found that to be particularly troubling because the film was celebrating a success as if that success was finished, fully accomplished, and remains in place when that is not at all the case,” she said. Other scholars say Selma provides a sufficiently rich trove of historical details that are instructive, as well as inspirational, to Americans interested and engaged in social justice efforts. Dr. Ibram X. Kendi, an assistant Africana Studies professor at the University of Albany-SUNY, says it’s possible that Selma could resonate with young Americans, in ways similar to how Spike Lee’s Malcom X found favor with African-American audiences in the early 1990s. “In the 1990s, there was a resurgence of Black nationalists organizing and some of that was attributed to the re-emergence of Malcolm X in popular culture. And that emergence of Malcolm X in popular culture can be directly attributed to Spike Lee’s film,” said Kendi, who is the author of The Black Campus Movement: Black Students and the Racial Reconstitution of Higher Education, 1965-1972. Dr. Learotha Williams, a professor of African American and public history at Tennessee State University, says that Selma is unique and “groundbreaking” as a theatrical film about the civil rights movement, in that it examines King as an influential American leader and that it documents in detail an important chapter of the civil rights movement. “It’s an important film because for the first time audiences will be getting a more complete understanding of the movement, of an individual who was leading the movement, and of all the kinds of variables that went into what they were doing. Hollywood doesn’t really turn out movies like this,” he said. Thelma Vickroy, a professor of television production at California State University, Northridge, says that Selma is a film that will be one she can use in the film and television production classes she teaches. Citing its cinematography, script and music, Vickroy says the film provides ample material of innovative filmmaking she believes will engage her students. She added that the film strongly reflects the influence of a woman as its director and it’s noteworthy that its women characters have heightened visibility given that most of the civil rights movement leadership positions were held by men.